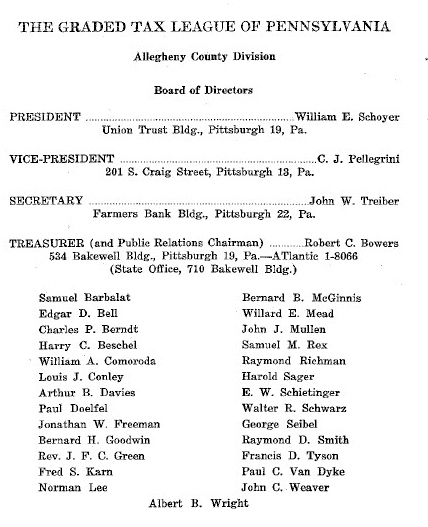 Birthplace staff recently organized and uploaded new historical material including a collection on the Graded Tax League of Pennsylvania and Related Associations and one on the Public Revenue Education Council. Both collections chart the origins and activities of two important Georgists organizations and their leaders. The Graded Tax League of Pennsylvania was established in 1950 by the Henry George Foundation of America. The purpose of the League was to promote the passage of a new state law that would authorize other cities in the state to enjoy the same graded property tax system that had been in place in Pittsburgh since 1913. 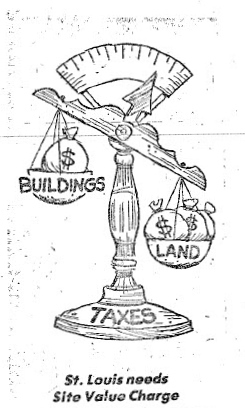 Under this system, land values were taxed at twice the rate of buildings. Series Two of this collection contains publications on the history and operation of Pittsburgh’s Graded Tax System. The League appointed Pittsburgh’s former Chief Assessor Percy R. Williams and one-time Pennsylvania Congressman Charles R. Eckert to lead the political campaign while other League officers focused on education and outreach. Williams also was a founding member of the Henry George Foundation of America. In 1951, the Pennsylvania State Legislature authorized “third class” cities – any city with a population less than 250,000 – to adopt a graded property tax system upon the approval of the city council. Over the next two decades, the League established offices across the state and promoted the benefits of a graded tax system and lobbied city councils to adopt a graded tax plan. 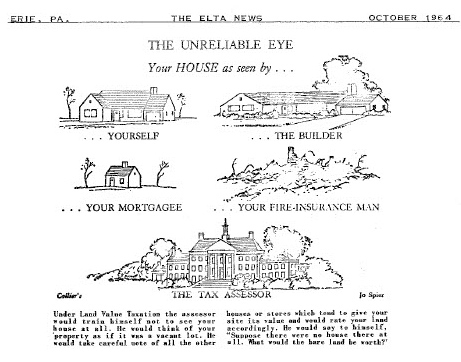 The Erie Land Tax Association (ELTA) was formed in the early 1960s to educate the citizens of Erie on the advantages of taxing land values higher than buildings. Series Three of this collection features documents pertaining to ELTA activities. In 1974, the Graded Tax League changed its name to the Incentive Tax League of Pennsylvania and Steven Cord became its president. Series Four includes material on the Incentive Tax League including Incentive Taxation edited by Cord. The Public Revenue Education Council (PREC) formed in the winter of 1950-1951 and was incorporated as a non-profit educational institution by the State of Missouri on January 31, 1952. The PREC mission includes educating the public about the collection and expenditure of public revenue; the elimination of artificial barriers to the production and distribution of wealth and services, and; the removal of the barriers to the natural incentives which encourage maximum economic productivity. Still active today, the PREC derives its operating income from contributions, grants, membership fees, and the sale of literature. Series One of the collection features the correspondence and publications of its long-time President, Noah Alper. Alper also headed the Henry George School of Social Science extension in St. Louis, Missouri. Series Two includes written material produced by other PREC officers and Series Three features PREC brochures, pamphlets, and annual reports.